Considered a masterpiece of modern cinema, Fellini’s Oscar-winning film, La Strada (The Road), will be brought to the stage in a brand new production with music by Benji Bower, directed by Olivier award-nominee Sally Cookson. La Strada receives its world premiere at the Belgrade Theatre, Coventry, as the start of a 16 week UK Tour prior to opening in London at The Other Palace, where it will run until 8 July 2017. Tour dates and ticket links can be seen below. 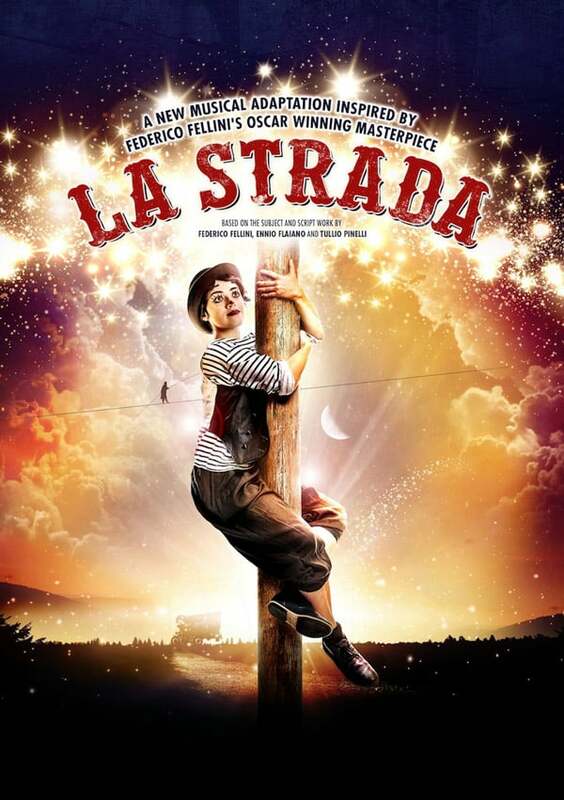 A soul-searching story filled with beauty, sadness, humour and acute observation, La Strada tells the tragic and tender tale of wide-eyed Gelsomina who is sold by her impoverished mother to the brutish strongman Zampano, a travelling sideshow performer. Their journey through the Italian countryside leads them to a ragtag touring circus where they meet Il Matto the free-spirited tightrope walker, who tries to rekindle Gelsomina’s broken spirit. Featuring live music and original songs, La Strada brings together a multi-skilled cast of performers and musicians. Audrey Brisson (Cirque de Soleil’s Quidam, Kneehigh’s The Cast of the Flying Lovers of Vitebsk, Dead Dog in a Suitcase, The Wild Bride and National Theatre’s The Elephantom) plays Gelsomina, Stuart Goodwin (Sally Cookson’s Sleeping Beauty; Kneehigh’s Tristan & Yseult) plays Zampano and Bart Soroczynski (Cirque de Loin’s The Fool & The Princess; ENO’s Benvenuto Cellini; RSC’s The Merry Wives of Windsor) plays Il Matto. The ensemble cast includes: Matt Costain, Fabrizio Matteini, Sofie Lybäck, Niv Petel, Niccolo Curradi, Tatiana Santini, Luke Potter and Tee Jay Holmes. Further casting to be announced. La Strada is directed by Sally Cookson, with musical direction and music by Benji Bower, ‘writer in the room’ Mike Akers, set and costume design by Katie Sykes, lighting design by Aideen Malone and sound design by Mike Beer.